In an automated shopping environment are you marketing to people or machines? Phil Sutcliffe, board director, offer and innovation at Kantar TNS delved into voice activated devices and the broader implications of shopping when people are simply saying ‘buy me some coffee'. While he predicted that automated purchasing will become mainstream in the near future, there will still be a role for brand marketing and building. But changes will be required; instead of mental availability there will need to be mental disruption – so that there’s a strong enough brand message for people to be sufficiently inspired to put your brand in their favourites or choice categories. Instead of physical availability, there will need to be physical disruption, and one way of doing that is with sampling. "Machines can buy stuff but they don’t use it and sampling is a great way to get into consideration criteria," said Sutcliffe. As footfall to physical stores has declined with the rise of online shopping, Fiona Blades, president and CEO of Mesh Experience urged marketers to take an experience-driven approach to retail. But within that context, better measurement of the retail experience is needed and she talked through initial research done in the US to understand how retail displays reach and engage shoppers. By putting cameras in display materials, people visiting the shelves or counter could be counted, along with analysis of their expressions, time spent and engagement. "Billions are spent on display with a dearth of evaluation. 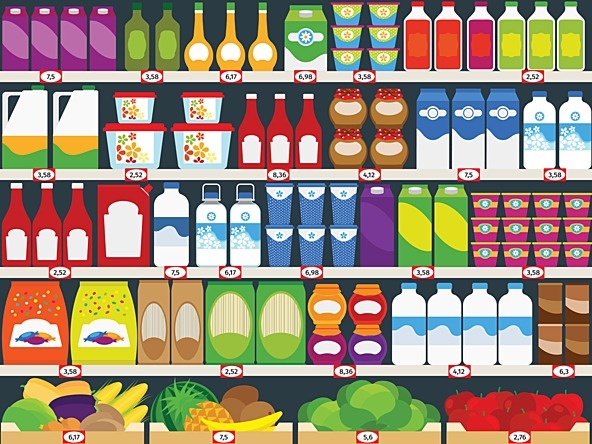 Technology can really help FMCG understand the ROI. We know location is really important. Retail isn’t just about transaction any more, it’s about experience," said Blades. While an engaging experience can have three times the impact of a neutral one, brands have very little time to grab attention – people were only engaging with displays for three seconds at most. Vanessa Henry, shopper insight manager at IGD, shared detailed insight into the way people shopped for groceries online and what that might mean for supermarkets. Its research showed that the main reason people use online grocery shopping is for convenience, with uptake largest among young families. Just under half ( 43%) of shoppers have shopped online for food or household groceries in the past month. One of the biggest barriers has been the delivery fee but the rise of saver passes has helped increase frequency of online shopping and locked in shoppers, so building loyalty. But despite retailers pushing click and collect, as a way of boosting profitability, 90% are still opting for home deliveries. To understand how people are navigating the sites IGD used embedded screencast technology with online communities to record the online grocery shop. It found that most do the shop in one sitting although some do amend after initial checkout – so there are brand opportunities to engage with shoppers after the initial checkout. And despite the rise of mobile, most are still using larger screen devices to do their shopping although adjustments and order amends are invariably by smartphones. Shoppers’ primary task is getting a delivery slot and there is very little impression made by the home page. Getting to the product items is much more complex online – are they going straight to favourites or using search and plugging in their list, or do they go to the offers page, or use category menu going through aisle in a methodical way? "Favourites and search is about speed and planning while offers and products is more of a browsing mindset," said Henry. And it’s the check-out walk that gains the highest level of engagement with its personalisation. For its YourGoodSkin range, Walgreens Boots Alliance established an online community in the UK and US . Susannah Croucher, research director at MMR and Philippa Bradley, global brand manager at Walgreens Boots Alliance said that while the community was a fabulous asset, it was not easy. With a full-time moderator, the community was more than a tracking tool and for almost three years it was used for formal and informal research, covered quant and qual, and could achieve overnight responses. Boots ran 43 surveys, managed 447 discussion threads and collected 79,722 responses in total. Bradley explained that they identified 50 of its most active users – super users – who became an extension of the brand development team and some even featured in a documentary it made and endorsed the products that they helped develop. feedback into the community so they can see the impact of their insight. In many categories it is the smaller players that are achieving the most impressive growth and the rise of digital has made it easier for them to reach consumers online. So for a business like PepsiCo, understanding the rise in popularity of more niche brands was vital. Laura Wilson, senior consumer insights manager, snacks, Western Europe, Pepsico and Sophie Wells, director, Tempo, Hall & Partners explained how they used a repeatable snacking diary app to gain in-the-moment insight into the snacking choices people were making. Users took a photograph and detailed the occasion, motivations were identified with three or four open-ended questions and there was an emoji-style question to find out how they felt along with some outcome questions on how happy they were with their choice. The study involved 250 people across two weeks, 2180 snacking moments and coded more than 200 brands. then it was about activating against those needs with pack design, nutritional information etc. Wilson said: "We dispelled some internal myths. One outcome was that it was not all about authentic brand stories, there were more important factors. It was quite illuminating for the team on where our weaknesses are but also gave us some confidence in mainstream brands. Even among those buying into small brands, there was still had an inherent love for Walkers." Wells said this type of research was "a lovely sweet spot between qual and quant – the richness of qual but data to back it up."